The first reported sighting in the Boulia area of the eerie unexplained Min Min Lights was in the early 1890's, over the grave at the rear of the Min Min Hotel. This hotel, which burnt down in the early 1900's, was situated on the Kennedy Developmental road from Winton to Boulia. There were several such 'hotels' on this road during the heyday of Cobb and Co as they were stopover points for the coaches. There is no scientific explanation of what the Min Min Lights are, there are many theories but nothing has been proven. Visitors talk about seeing these strange bobbing balls of light whilst driving along the lonely roads at night or whilst camping in the area. Many visitors have not been game to tell people of their experiences in case they were ridiculed, but these lights are real and have been seen by too many people to be imagination. 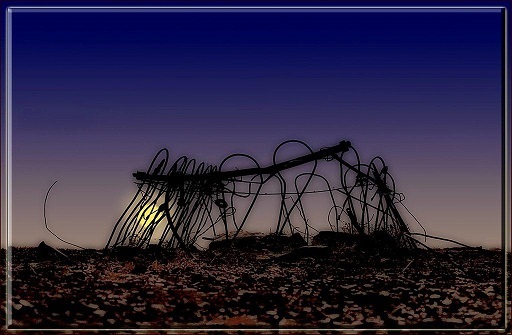 The below photograph is of a grave situated at the site of the Min Min Hotel where nothing remains today except large areas of broken glass and maybe a Min Min Light.